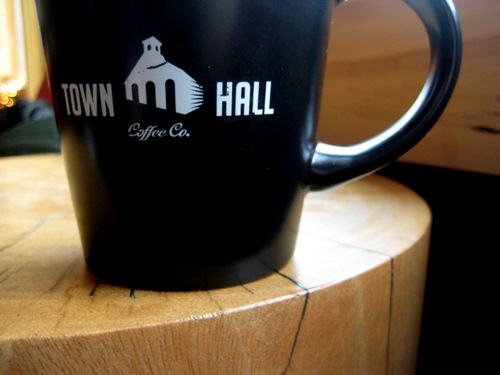 I’d been wishing for better coffee shops around my hood, so I was excited when I found out about Town Hall Coffee. I checked it out on a cold saturday morning. Oh, this place is in an unfortunate location. You can barely tell it’s there. It’s in the same strip that Hymie’s is in, but unless I knew that, I would have never noticed its existence. You can barely tell from the street it’s there. There is a small parking lot behind the place, but you also have to know that’s there. Otherwise, it’s street parking on Montgomery, and Montgomery is a busy street, especially there. The place is really attractive and decorated well. You can tell a lot of thought was put into every detail. It’s a shame it is where it is. Move it somewhere a bit more easy to find and get to, and it would be doing gangbusters. 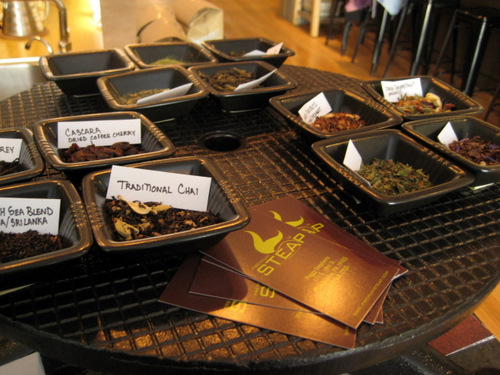 They obviously have coffee, but also have an array of teas from Steap. There’s also a little bit of food too, which I did not try. A beautiful espresso. I especially love the tree stump tables they have. Some of their big chairs are comfortable, some are not. You have to try them out. 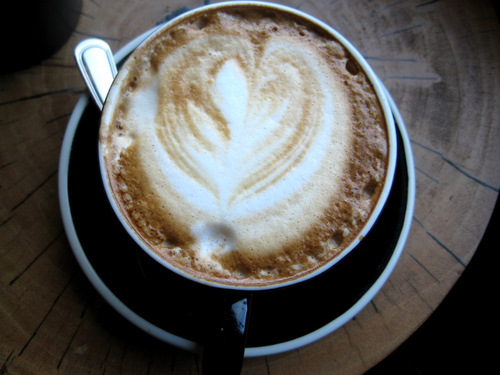 A latte. Their coffees are strong, which is good. They rotate the beans from various fancy schmancy places, like Counter Culture and Intelligentsia. Perhaps this is why the prices are a bit on the high side, in my opinion. I know we’re in the main line, but we’re not in the mission in san francisco. It’s kind of strange to be charging san franciso prices. J got a bagel while we were here, and he did absolutely love the bagel. We’re thinking it comes from Hymie’s or wherever Hymie’s gets their bagels from. It was also perfectly toasted, almost unnaturally so. What kind of toaster is this? Is this some industrial secret type toaster technology reserved for restaurants? All I know is i definitely want one. I have one big bone to pick with this place – the noise due to the kids. They actually have an area in the back which seems to be geared for kids or people who want to bring their kids. But once you do this, the coffee house vibe is gone. Instead, it sounds like a freakin playground. I don’t know about you, but when I go to a coffee shop, I don’t go there to hear screaming kids, and that’s what I experienced that day. It’s a great idea to cater to main line moms, but it just seems a bit disjointed for people who want to relax on a saturday morning with some coffee and their laptop. Perhaps they need to do more work on soundproofing. It’s clear that they put a lot of love into this place. Everyone working was friendly and the coffee is quite good. Even the atmosphere totally works for me. They also have great hours. But man, I certainly won’t be coming back during the day! I think it’s a shame you’ve already made up your mind not to give this place another try, especially after just a single visit… but as someone who goes there fairly frequently, I thought I’d set things straight for any curious folk who happen to stumble upon this “review”. 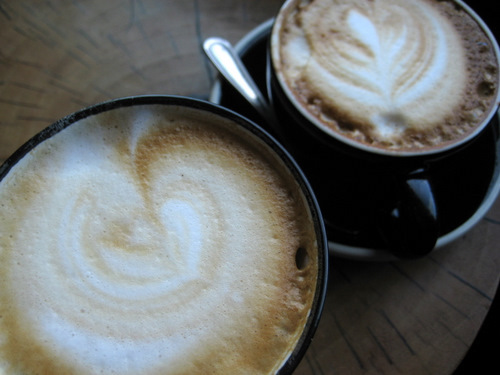 The allure of a place like Town Hall Coffee is the quality of the coffee and customer service – two things they take pride in delivering to their utmost best, with every attention to detail. 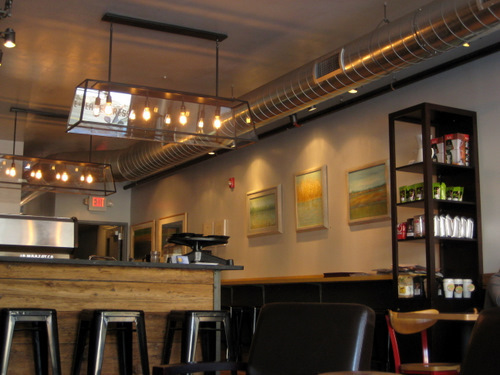 The bright, airy atmosphere is what draws you in, but it’s the fresh coffee and conversation with the baristas that keeps you coming back. The entire staff is more than knowledgeable about every aspect of what they’re doing, and they’ve always greeted me with a smile. For the record, they pick up their bagels from NY Bagels on City Ave, and they’re kosher! The coffees, milk, and syrups they offer are all kosher too. It’s also worth noting that the majority of their pastries are homemade and baked fresh daily, and they also have fresh french pastries from a local bakery that get delivered each morning. It also seems a tad silly to complain about parking, considering the fact that Merion Station has more parking lots/spots per square foot than it does businesses… I know we live in the modern age where everyone needs to get to where they’re going fast, but if you can’t take a few extra minutes out of your day to walk a few feet to get your cup of coffee, then you probably shouldn’t be stopping for coffee to begin with. And next time you’re in an establishment with noisy kids running around, perhaps you should take it up with the parents of said little noisemakers. It’s not a business’ fault that parents don’t know how to teach their kids to behave in public, nor is it their place to reprimand them for it. If it’s irritating you as a customer, just step up and have a word with the parents; it will be a reality check for them at the very least. 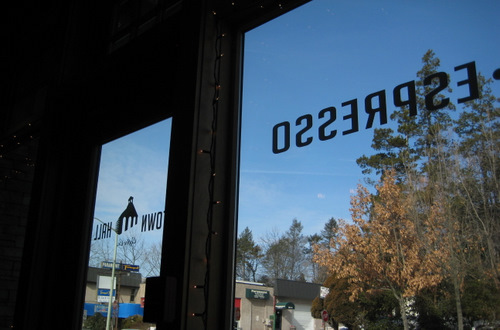 Perhaps if you had based your review off of more than just one visit, you’d have a different opinion of this lovely coffee shop. I didn’t know there was a parking lot back there. I’ll have to look for it next time I go to Hymie’s!